Could it be that an important textbook is proselytizing American 12-year-olds to convert to Islam? The book in question is Across the Centuries (Houghton Mifflin, 2nd edition, 1999), a 558-page history that covers the millennium and a half between the fall of Rome and the French Revolution. In the multicultural spirit, about half of its eight sections are devoted to the West, and the other four deal with Islam, Africa, Asian empires, and pre-Columbian America. 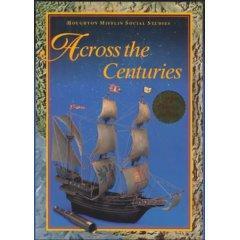 Across the Centuries is a handsome artifact, well written, packed with original graphics, and generally achieving the publisher's goal that "students learn best when they are fascinated by what they are learning." Apologetics: Everything Islamic is praised; every problem is swept under the rug. Students learn about Islam's "great cultural flowering," but nothing about the later centuries of statis and decline. They read repeatedly about the Muslims' broadmindedness (they "were extremely tolerant of those they conquered") but not a word about their violence (such as the massacres carried out by Muhammad's troops against the Jews of Banu Qurayza). Identification as Muslims: Homework assignments repeatedly involve mock-Muslim exercises. "Form small groups of students to build a miniature mosque." Or: "You leave your home in Alexandria for the pilgrimage to Mecca. . . . write a letter describing your route, the landscapes and peoples you see as you travel and any incidents that happen along the way. Describe what you see in Mecca." And then there is this shocker: "Assume you are a Muslim soldier on your way to conquer Syria in the year A.D. 635. Write three journal entries that reveal your thoughts about Islam, fighting in battle, or life in the desert." Learning about Islam is a wonderful thing; I personally have spent more than thirty years studying this rich subject. But students, especially in public schools, should approach Islam in a critical fashion - learning the bad as well as the good, the archaic as well as the modern. They should approach it from the outside, not as believers, precisely as they do with every other religion. Some parents have woken up to the textbook's problems. Jennifer Schroeder of San Luis Obispo, Calif., publicly protested its "distinct bias toward Islam." But when she tried to remove her son Eric from the classroom using this book, the school refused her permission and she filed suit in protest a few weeks ago (with help from the Pacific Justice Institute). Across the Centuries involves a larger issue as well - the privileging of Islam in the United States. Is Islam to be treated like every other religion or does it enjoy a special status? The stakes go well beyond 7th-grade textbooks. The next edition of Across the Centuries should give a hint of what's in store. Readers may wish to send their opinions to Houghton Mifflin's editorial director for school social studies, Abigail Jungreis (Abigail_Jungreis@hmco.com). Feb. 12, 2002 update: A day after the publication of the above article, Houghton Mifflin distributed a press release on its website that responded to me by name. July 3, 2002 update: For another problem with a public-school textbook, this one Islam: A Simulation of Islamic History and Culture, 610-1100 (Interaction Publishers, Inc.), see my article today, "'Become a Muslim warrior'." July 16, 2002 update: At some point in recent months, Houghton Mifflin withdrew the first press release in favor of a second one that does not mention me by name, only the New York Post. It also makes many other changes, generally softening the company's counterattack on me. Dec. 17, 2002 update: I look today at a "Muhammad: Legacy of a Prophet," a parallel use of taxpayer-funded television in an article titled "PBS, Recruiting for Islam,"
Nov. 24, 2004 update: I look at the Islamist drive to proselytize in "Spreading Islam in American Public Schools." In particular, I look at one article, "Dawa in public schools," that sees those schools as "fertile grounds where the seeds of Islam can be sowed inside the hearts of non-Muslim students. Muslim students should take ample advantage of this opportunity and present to their schoolmates the beautiful beliefs of Islam." Apr. 6, 2005 update: I recount the fate of another textbook, History Alive! The Medieval World and Beyond (Teacher's Curriculum Institute), at "'History Alive!,' Scottsdale Schools, and a Reader's Comment." Nov. 18, 2005 update: For the decision of the Ninth U.S. Circuit Court of Appeals.that classroom instruction of Across the Centuries at the Excelsior School in Byron, California, does not constitute religious indoctrination, see "Courts: Okay to Proselytize for Islam in California Schools." Related Topics: Academia, Dhimmitude, History, Muslims in the United States | Daniel Pipes receive the latest by email: subscribe to the free mef mailing list This text may be reposted or forwarded so long as it is presented as an integral whole with complete and accurate information provided about its author, date, place of publication, and original URL.